Two Bishops advise people not to let their anger over the MP expenses scandal influence how the vote nex month. The Archbishops of Canterbury and York have urged voters not to vote for the BNP in next month's elections because of anger over the MP expenses scandal. "I don't think you beat the BNP by telling people how to vote." Especially if it comes from politicians. It is about time that senior members of the Church of England make a stand against the far right extremist like the BNP. The BNP just peddle hate. The Southall Broadway ward is getting a mobile camera to tackle anti-social behaviour. Unfortunately, it won't be too mobile, as those attending the latest Southall Broadway ward forum meeting found out. The camera has to fixed to a specific location and can only be moved 3 or 4 times per year due to cost restraints. The ideal situation would have been to move it to different location every week. Gurkhas who have been willing to die for the United Kingdom have had their services properly recognised - at last. "Generations of Gurkhas have served the United Kingdom with great courage, sacrifice and distinction" and yet those who retired before 1997 are not allowed to apply for settlement in the UK. In September 2008, the Gurkhas were celebrating one of their most famous victories, in a legal battle, the High Court gave them the right to settle in the UK. But the UK government was having none of it. It did everything in its power to deny the Gurkha the right to stay. Thanks to actress Joanna Lumley, some MP's with guts and public opinion, the government has finally conceded. Gurkhas who served for four years or more will be able to apply to settle in the UK. It comes as no surprise that another report concludes that Iraqi government corruption is rife. The worst offenders are - in no particular order - the ministries of defence, interior, finance, education and health. "The report does not even scratch the surface of what goes on. Millions, billions of dollars are being stolen," says an Iraqi MP and member of the parliamentary anti-corruption committee. "The problem is that senior officials are never punished in Iraq," she said. Many Iraqis depend on free "government food rations" to survive. The ministry of trade is accused of making millions by selling the food aid to traders. These are openly on sale in the bustling Shorja market in Baghdad. "Under Saddam things were bad, but now they are worse," said a former political exile and opponent of Saddam Hussain. According to the anti-corruption group Transparency International, Iraq is one of the most corrupt places in the world, third only to Burma and Somalia. Those who put together these anti-corruption reports, either have law suits filed against them by the acccused Iraqi ministry or get shot in the streets of Baghdad. What has changed for better? Was it worth all the destruction and bloodshed? The Local Council website - London Borough of Ealing - has been out action for a few days. We are working to fix this problem and restore a normal service as soon as possible. Please only telephone the council if your enquiry is urgent. The Indian Table Tennis team play a friendly match with the England Team in Southall. The friendly match took place at the Dormers Wells Leisure Centre in Southall. It was the first of 3 friendly matches taking place before the start of the 18th Commonwealth Table Tennis championships starting in Glasgow on May 19. The result was a draw. 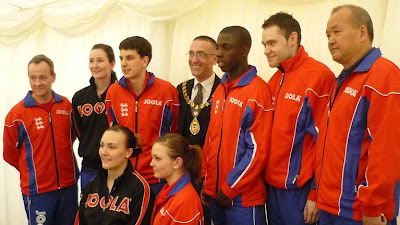 The Mayor of Ealing and other dinitaries were present at the after match VIP ceremony. After the match and ceremony, the Indian and England team dined at Chaudhry's TKC on Southall Broadway. The Indian team was transported to Chaudhry’s TKC restaurant in the famous tiara bus. 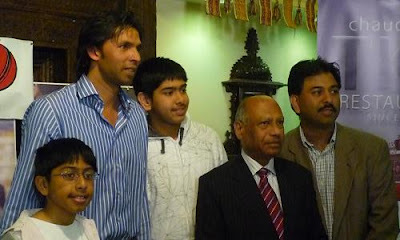 Southall MP Virendra Sharma attends press conference for Pakistan cricketer Mohammad Asif. It tool place at Chaudhry’s TKC restaurant in Southall. The Ealing Southall MP, Virendra Sharma, missed the actual conferences but arrived in time to mingle with the guests and have a bite to eat. Asif mingled with the audience, signing autographs and having his picture taken with enthusiastic fans, young and old alike. Mr Sharma was one of these individuals. A press conference on behalf of Pakistan cricketer Mohammad Asif was held in Southall. It was organised by Dalawar Chaudhry and the venue was his restaurant, Chaudhry’s TKC in Southall. Asif has agreed to be a positive role model for the youth of Southall by providing his expertise to cricketing youngsters of Southall. How that will happen is in its early stages. He mingled with the audience, signing autographs and having his picture taken with enthusiastic fans, young and old alike. Cricket can overcome obstacles like nationalism and religion. Mr Brij-Mohan Gupta, Chairman of the Hindu Culture and Heritage Society UK, was one such guest. His grandchildren had travelled 40 miles to see Mohammad Asif. He said that cricket loving fans don’t want politics in cricket; they merely want to see Mohammed Asif being allowed to play and be entertained.